You are here: Home / Ethnic Groups / The People of Sumatra / Who are the Serawai? 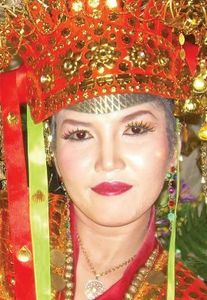 The Serawai are a Malay ethnic group who live in Bengkulu province. Serawai call themselves Orang Selatan (People of the South), even though there are Kaur and Besemah people in this southern section of the province as well. The Serawai have their own language, which has two dialects. The rural Serawai live in wooden houses raised on stilts which have thatched roofs made from leaves. The space below the house is used for storage or for keeping livestock. Villages are generally close groups of homes situated along a road or riverbank. The front of the house often has sun-shaped drawings symbolizing the light of Allah. Traditionally, a Serawai person’s home may not be directly across from the house of a sibling. Ancestral lines are drawn from both sides of the family. Determining where a couple lives after marriage depends on a formal agreement (kulo) between the couple and their families. Most Serawai make a living as rice farmers. To irrigate their rice fields, they depend on rain or a nearby river. The Serawai are also known as coffee farmers. They often go to other areas to start coffee plantations or become workers on a coffee farm. Other crops include cloves, brown sugar, rubber, and fruit. Recently, many Serawai have migrated to North Bengkulu to look for wider fields with better irrigation. When crops fail, they try farming in a different area of the province. Serawai villages that focus on fish farming have recently experienced rapid growth. Many Serawai people also work as civil servants, teachers, and day laborers. The Serawai area is not very affluent. In fact their lives may be considered economically difficult or depressed. Despite that, the area is considered very safe with low crime levels. Most Serawai people are Muslims, but their day-to-day lives are influenced by older beliefs. They fear ma’sumai, a ferocious tiger that can take human form, first attracting and then slaying its victims. They also perform ceremonies connected to farming. Before planting, seeds are washed in the mendundang ceremony. Newly harvested rice stalks are bound together during the nuruni ceremony. These are performed to show that the rice plants are properly respected, so that the spirit of the rice plants will not leave their fields, thus preventing crop failure. At certain times, farmers offer goats at the graves of their ancestors or holy places. A small percentage of the Serawai are Christian. There are around three generations of Christians so there are some whose grandparents were Christian. They are spread throughout a few areas and have formed Serawai churches. Some Serawai, especially the youth, are shifting from Christianity to embrace non-Christian religions. This is especially happening because of marriages between those of different religions. According to accounts, the reduction in the total number of Christians is very significant. A special effort to reach youth as well as the elderly is needed to deal with this situation. The Serawai farmers also need better irrigation systems so they are not wholly dependent on the rain.